Bad, lazy cooking makes me angry. My vicious defence of good food comes from my mum. She was a single parent, bringing up four kids on next to nothing, but we still ate like kings. There were no turkey twizzlers in our house. Mum split up with my dad when I was still a baby. Her second husband took off when I was 12 and my three sisters were eight, four and a babe in arms. We moved from a council house in North London to a little town in Devon and there were times when we were totally skint, but she always made sure we ate well. When money was tight we lived off lentil soup and amazing vegetable stir fries. I'd go out fishing in a boat with family friends and we'd eat what I'd caught. We'd buy pheasants from the big house after the City boys had been down for a shoot and bagged enough birds to feed a family for a year. I can still cook a mean braised pheasant casserole. My mum, with her hippy philosophy of peace, love and good food on a shoestring budget, gave me my passion for fresh, great quality ingredients; my capitalist dad, on the other hand, taught me a tough lesson about ambition, dedication and hard graft. Dad grew up in a poor part of London, but escaped the poverty by winning a scholarship to a good grammar school. He wore a second hand school uniform, but he fought tooth and nail to get on, and by the time he was 21, he was driving his first E-type Jag. He was only 25 when my parents split up but he didn't abandon me. For the next 15 years, wherever we were living, he would make the trip to see me every other weekend. That didn't mean time off for him - it meant work for me. From the age of five, he would give me stuff to do and as a teenager I could tackle the same kind of jobs as his other employees. He was driven by financial success and although he has eased off now, I learnt from an early age that there's no quick way to make a million. At the same time, I promised myself I was never going to let work swallow me up as it had him. I grew up fast and by 16 I couldn't wait to leave home. I got a place at Torquay College, doing my National Diploma in catering. It was very practical. I learnt knife skills, how to make a béchamel and roux - all the building blocks you need. I followed it up with two years at Bournemouth College of Food and Technology and an HND course in hospitality management. It was all talk, no action. Let's say, I was a little less studious. I remember the raves more than I remember the lectures - and even they're a bit of a blur. The one good thing to come out of it was a placement at Brian Turner's restaurant in Walton Street. It was the worst year of the recession - long days, hardly any bookings - but Brian was unshakeable and his son Simeon became one of my best mates. Handing in my notice, I took off around India and made it a short way up the east coast of Australia before my money gave out. I'd had a really great time, but then came a tough few weeks taking any job I could find. I picked cherries for a few dollars a day and scraped enough together to get to Cairns. I was down to my last few cents, desperate for any kind of work, when I heard on the grapevine that a chef had walked out from his job on one of the dive boat charters, which was setting sail that night. I raced to the harbour. They asked me if I could cook on board for 40 people. I said "yes" - it was one of the biggest lies I have ever told and one of the riskiest things I have ever done. Sure, I could find my way around a commercial kitchen, but I hadn't a clue about cooking on this scale - and on a boat in the middle of the ocean, there's no-one to step in if you f*** up. That afternoon, I went to the library (I couldn't afford to buy a book), found some recipes and photocopied them. I had to place the order right away, so I ran through the ingredients and wondered "how much milk do 40 people get through in a day?" Of course, I bought far too much stuff, but bulging store cupboards were the least of my problems - despite all that time I'd spent on boats off the Devon coast, I was horrendously seasick. I spent the first four days on board in the kitchen, with my toothbrush and toothpaste in my pocket. I'd be cooking, then there'd be a bit of motion and next thing, I'd be chucking up in the loo. Quick brush of the teeth and back to stirring the pot for lunch. The crew must have known - I was a pale shade of green the whole trip - but there was no way I was giving up. By the end of it, I'd found my sea legs and I went on to work on three other boats over the next six months. It was a fantastic, wild time and I saved enough money to travel up the west coast of the States on my way home. Back in the UK, through a friend-of-a-friend, I got a job as duty manager at the Bath Spa Hotel, under the legendary hotelier Robin Shepherd. For "duty manager", read "Jack-of-all-trades". I had to cover every department, running up and down stairs all day; turning rooms around for 150 between lunch and dinner; helping to fix the boiler in the early hours. I was working 90 hours a week and at night I could wring the blood out of my socks. It was before the National Minimum Wage came in and I reckon I was earning less than £1 an hour - but I loved it. Andrew McPherson, Billy Burchill and I were Robin's "class of 1999". We learnt so much from him - he was a real ladies' man, a total charmer, who could make guests feel like a million dollars - and he let us get away with blue murder. I was really keen to show Robin how entrepreneurial I could be and I kept badgering him with the idea of setting up an events catering business off the back of the Bath Spa's fantastic reputation. He shooed me away, so I went to Kall Kwik, had some business cards made and set up appointments as the hotel's "Outside Catering Manager". I sold one event, lost the company £500, and got a severe bollocking from Robin. He still had enough faith, though, to let me organise a couple of gala dinners, including a New Year Noel Coward night, when I got to do the set design and dress up all the staff in black tie and tails - note, no lime green nylon trousers. By now, London was the happening place for food - Terence Conran had reinvented Quaglino's; Oliver Peyton had opened Atlantic and Coast. There was lots of excitement and I wanted to be part of that. I hear a lot of young guys in this industry say they're not paid enough to eat in the best restaurants. Food is as important to me as rent, and I'd apportion some of my wages, catch a train up to London with Andy, go for a pint or two in the pub (we couldn't afford restaurant prices for drinks), then sit down in the latest restaurant hot spot for the two-course plat du jour and a bottle of house wine. Even then, I was stealing menus, taking photos, going back to Bath and putting together mood boards for fictional restaurants that I desperately wanted to make a reality. I was too baby-faced for property agents to take me seriously, so I told them I was a property scout for one of the big leisure companies, looking for sites for a new restaurant concept. That got me viewings of all the available properties in Bristol. At the same time, I was setting up spreadsheets to work out my gross profit (GP) on different menu ideas. By this time, I had progressed to deputy manager of the Bath Spa restaurant, but I knew that hotels weren't for me. Raymond Blanc had opened Le Petit Blanc brasserie and I heard it was packed out for every service. I wanted to understand the magic. I rang the general manager and offered to work there for free just for the experience. He said yes, I booked a week's holiday and set off for Oxford. I did a week of double shifts, soaking up the atmosphere, and I knew this was where I wanted to be. Within a couple of months, I had said goodbye to the Bath Spa and started work full-time, on the payroll, as deputy manager of Le Petit Blanc. When Raymond opened a branch in Birmingham, he put me in charge as general manager. I love Raymond's food ethic. He is the one who says if it's not right, don't serve it. He will only ever use the best ingredients and he cooks with real passion. While I was working at Le Petit Blanc Oxford, I shared a house with four guys and when they rolled in from the office on my days off, they would find me in the kitchen trying out Raymond's recipes - tarte au citron, roast guinea fowl - they ate very well. I worked at Le Petit Blanc for five years. Raymond and general manager Sunnil Panjabi became my bosses, my mentors and ultimately, my friends. They gave me the confidence to believe I could go out on my own. 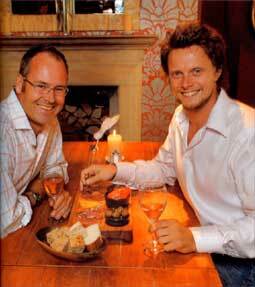 When the time was right, in 2002, Sunnil introduced me to a friend of his, Hamish Stoddart. Hamish comes from a classic business background and has the management skills they failed to drum into me at Bournemouth College. Hamish had recently sold his family business, Cearns & Brown, for vast amounts of money, to Brake Bros. He had spent six months in France learning to glide, but was back in the UK, acting as non-executive director for a couple of companies and interested in nurturing a new business - I wanted it to be mine. Within a few weeks, I'd persuaded him to come on board full-time and together we founded Peach Pub Co, with Victoria Moon, a really smart sales and marketing expert I'd worked with at Le Petit Blanc. 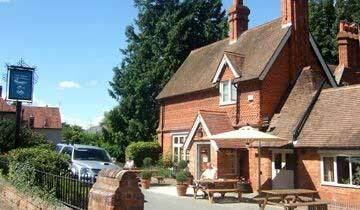 While Hamish pounded out the business plan, Victoria and I toured three counties, looking for a Midlands-ish property that would become our first Peach pub. We acquired an encyclopaedic knowledge of pubs in and around Birmingham/Oxford, before finally hitting on the Rose & Crown right in the centre of Warwick - well known as a seedy drinking den. We acquired the lease, gutted the interior and turned it into the kind of place you could take your mum or your girlfriend. 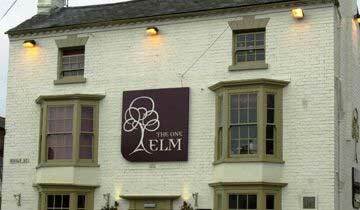 In 2003, we discovered the One Elm in Stratford-upon-Avon. A freehold this time, we bought it, did it up and created an amazing 75-cover split level dining area. Then the Fleece came up, on the Church Green in Witney. Lovely location but the previous owners had taken a grotty pub and turned it into a snooty restaurant. 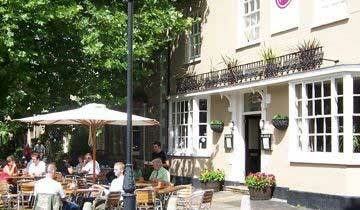 We turned it back into a fabulous bar and restaurant, with private dining and 10-bedrooms. We had already decided that pubs need the owner-manager touch. 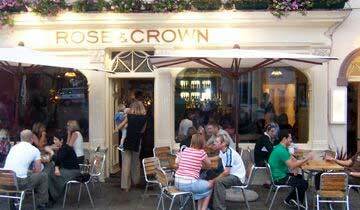 One person can't run more than three pubs without losing that personal involvement. We wanted to recruit joint venture partners, so we could expand Peach without losing our whole ethos. Hamish and I nobbled Andrew Coath, a fantastic hotelier and events organiser, and persuaded him to come on board as our first JV. 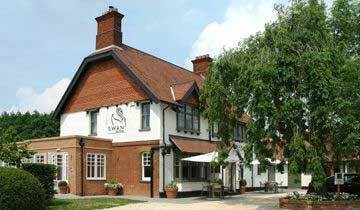 In 2005, Andrew opened the Black Horse in Woburn and the Swan in Salford, both instant hits with everyone who thought Milton Keynes was a culinary desert - genuinely warm welcome, outstanding service, great food, amazing attention to detail and gorgeous surroundings. 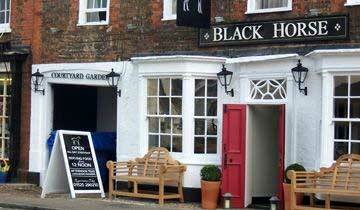 We found another pub for Hamish, The Fishes, in North Hinksey Village, just outside Oxford. We turned a dark seating area into a light and airy restaurant, opening onto a new decked terrace, overlooking three acres of grounds leading down to the river. Last year, 2006, we met Alan Turtill at the Best Places to Work in Hospitality dinner and persuaded him Peach was just that. 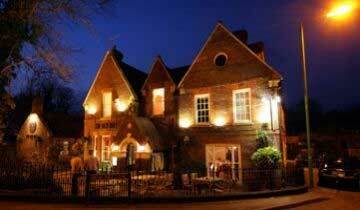 JV number two on board, we found the Old Mill, Berkhamsted and took it over in December. It needed vision to see past the grime, the cobwebs, the fake beams and the stud walls, but all that was swept away in March 2007, when the Old Mill reopened after a three week refurbishment and the locals just raved about it. The team rallied round after head chef Michael had a car accident and the doctors declared him out of action. Despite all the teething trouble you'd expect with a new site, we cracked £31,000 turnover in one week - somewhere in the region of five times the take in an average food pub. We've just celebrated winning two regional National Business Awards, one for customer service, the other for corporate social responsibility. Other trophies in the cabinet include BII Licensee of the Year 2007 for Andrew and we were named the One to Watch Rising Star of the licensed retail sector in the Retailers Retailer Awards. My dad taught me to work hard, my mum encouraged me to experience everything life has to offer. I put a lot of energy into building my business, but I put just as much effort into my social life. At 22, my friend from Torquay College days William Ireland (whose family owns the Cottage Hotel, Hope Cove, Devon) took me skiing and I was hooked on that. The next time, I converted to snowboarding and I have been every year since. It's a maniac sport that combines speed and an element of danger, with drinking and partying. It attracts a whole bunch of people prepared to risk their limbs on the slopes by day, and shoot beers all night - that's my kind of sport. I met my partner Victoria Marr, when I was at Le Petit Blanc in Birmingham. She's a soloist with the Birmingham Royal Ballet and used to come in for lunch with some of the other dancers. Given half a dozen beautiful ballerinas, it didn't take me long to wind my way over to their table but we didn't get together until the opening night party for another Birmingham restaurant. Even then I nearly blew it, because I was more interested in meeting one of my idols and a fellow guest at the event, Jeremy Mogford. He built up the Brown's chain and sold it for an exceedingly large amount to one of the pub groups. I've always been a bit sniffy about reality TV shows, the kind where D-list celebrities are shut up in the Big Brother house or sent off to the jungle, and when Raymond called to ask if I'd be interested in being a judge on The Restaurant, I had to do a lot of soul searching. This is genuinely not an ego trip. I said yes, because it's what I do, what I love, what I feel passionate about. With Peach Pub Co joint ventures, we help people realise their dreams. The production company wanted to make a great programme that would hook the audience - but in doing so, they were giving one couple the opportunity to change the way they live and work. It felt right. I had no idea how much time it would take, but the Peach team have been brilliant, keeping everything running smoothly while I've been discovering the very different world of television. It has been great fun, and it will be a kick seeing myself on TV - hello mum! - but even better, I'm pleased I had a say in who won the prize and I'll be around if they need a hand getting the business up and running.